“Motorcyclists are so traditional. It’s almost impossible to sell them something new.” –– That’s a comment made by Jay Leno in a recent episode of Jay Leno’s Garage. He was talking about the Aprilia Mana 850. The Mana is one of a slowly growing number of motorcycles with automatic transmissions. Apparently it has been around since 2008 but, not surprisingly, hasn’t done well enough in the UK that Aprilia is selling them here anymore. The two things the British hate most are change, and spending money; so getting them to suffer the latter for the sake of the former is always going to be an uphill battle. And if their attitude toward cars with automatic transmissions is anything to go by, automatic bikes may never catch on over here. A few months ago, my wife and I rented a car to drive down to visit her grandparents in Devon. When I arrived at Avis to pick up the car I was upgraded to an Audi A4 because it had an automatic transmission. The fella at the counter told me other customers had refused the car because they felt they wouldn’t know how to drive it, but he reckoned I’d be OK because I’m American. I have no doubt most British motorcyclists feel something quite similar, if not vehemently so: that if a person has an automatic motorcycle he or she shouldn’t be riding in the first place. This hasn’t stopped Honda from offering the DCT version of the NC700X in her majesty’s United Kingdom, but it appears that much of the automatic transmission push is toward customers in North America. For instance: according to all the press I can find, there are no plans to bring Honda’s new CTX700 range to Britain. Which is a shame, I think, because it is a pretty good-looking bike. And I think an automatic transmission would be a valuable asset when navigating Britain’s inanely tiny, counterintuitive and outdated (1) road network. When I wrote my post on the NC700X a while ago I said that I’d prefer one with a manual transmission. But lately I’ve been thinking: why would I prefer that? Is there really anything so wrong with an automatic-transmission motorcycle? Perhaps, in fact, such a thing is a really good idea. That’s a category into which just about all my friends fall. Every time I’ve mentioned this whole motorcycle journey to one of them they’ve confessed that they, too, have often daydreamed of getting a bike. They are. There’s no denying that. Body popping your way into and out of junctions takes a certain Jesus Take the Wheel faith that many people don’t feel comfortable with. Taking some of the dancing out of the experience might be just enough to encourage more people to give it a try. Especially when combined with other safety features such as ABS and traction control. Yeah, British bikers complain about those things, too. For my part, however, I would love to have them on my bike. I like being safe, amigos. And what appeals to me about motorcycling is that simple feeling of being on two wheels: in the open, able to glide along almost by thought rather than action. That’s a feeling not necessarily tied with jiggling my left foot and cramping my left hand. But why not? Why isn’t it for me? The more I think about it, the less I can come up with an answer. I’ve already said I’d love to have an NC700X, so it’s not a matter of not liking the look of a bike in which automatic transmission is offered. And if I’m honest with myself, removing the Gear Change Two-Step from the whole process of riding would probably give me a greater confidence. Living in the UK and working under my current budget constraints it’s unlikely that I’ll have the opportunity to make such a choice anytime soon, but if I had the option of riding automatic I think I might just give it a try. Perhaps, though, that’s because I’m a lazy American. 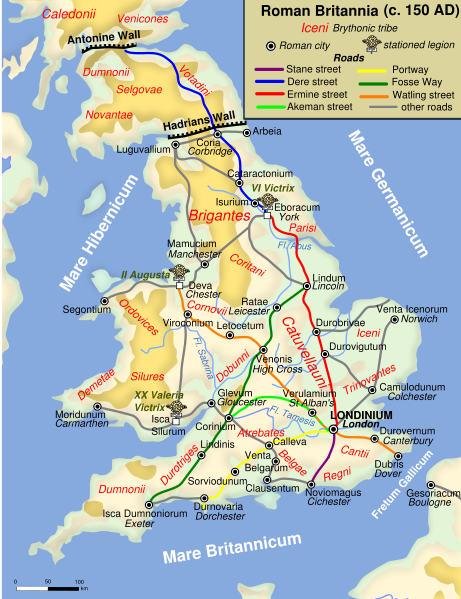 (1) Look at this map of roads that were built by the Romans almost 2,000 years ago. Compare it with the major roads used in the UK now. Note that the routes are EXACTLY THE SAME.